For many years, I have advocated the Move Every Paper Forward Every Day (MEPFED) model of working. The MEPFED model basically says “every day, insert something related to each one of your research projects/papers on your To-Do list, so that collectively, every week you’ve moved most/all of your work forward“. MEPFED has worked for me very well now that I am a professor, but it did even during my PhD days, because I also was working on two other side projects (my governance of wastewater analyses and my transnational environmental non-governmental organizations research) besides my doctoral dissertation work. @raulpacheco In one week I can go from #mentalhealth to #infectiousdisease to #cancer to #ethics. I need #strategy! I have experimented before with the Work on One Project Each Day (WOPED) model before too. The WOPED model says, give or take, that “in order to keep your concentration, you should work on one single thing per day. 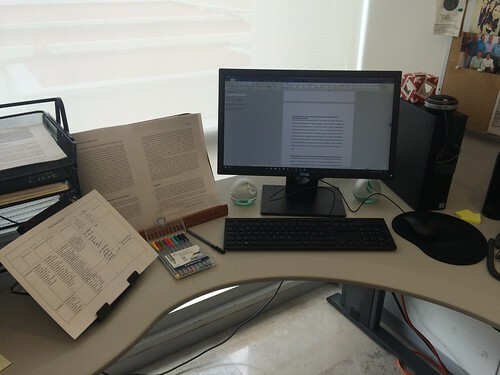 That way, your focus on specific theories, data, models, will enable you to finish the paper/project/analysis more quickly“. In fact, my plan this 2017 was to do WOPED, and I basically had it all well laid out: Mondays, my bottled water work. Tuesdays, water and energy. Wednesdays, informal waste pickers. Thursdays, environmental NGOs. Fridays, human right to water. You can guess how well that went. The problem I have with the WOPED model is that I get bored quickly. There is a reason why I wrote about the techniques I use to regain focus when I am distracted. Remember, I am an interdisciplinary scholar, working on a variety of topics. I read broadly. I write on a diverse range of themes. I use different research methodologies. So, WOPED only works for me when I am about to finish a paper (usually, when I am on a strict deadline). At that point, I assign ONE DAY to finish a particular analysis, dataset or paper. When I was pondering about this blog post, I started thinking about other models of WOPED workflow that I’ve either used or advocated for. For example, I do have dedicated buffer days, reading days, administrative days. But even during my buffer day I catch up. 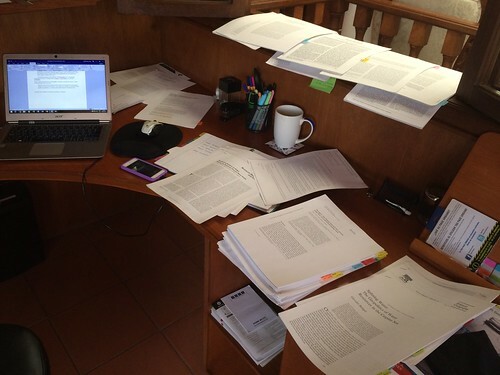 The only way in which I would apply a WOPED workflow would be if I only read (and scribbled, annotated, wrote memorandums, rhetorical precis, or dumped quotations on my Citation Worksheet). MEPFED works really well when you apply the Granular Planning and Rule of Threes and break down a project into smaller tasks that you can then drop into your daily To-Do lists. 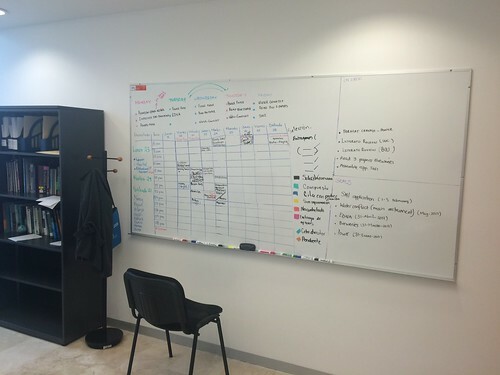 For example, my good friend Dr. Adriana Aguilar Rodriguez (Centro GEO) has adopted MEPFED for her own research (photo of her Weekly Project Whiteboard used with permission). WOPED is very useful when you are able to focus an entire day on one task. For example, I used to only prepare lectures on Fridays, and that’s when I focused entirely on one (or in this case, two) topic(s) (public policy analysis and regional development). You can also apply WOPED by devoting one day to cleaning a dataset or running a particular analysis. There are two instances where I find that WOPED is most valuable: when I have to finish compiling or cleaning a dataset, or writing a paper or when I have to do fieldwork. I use entire days for fieldwork (as I did a couple of weeks ago), and I usually visit one city per day. I won’t advocate for one particular model, as I often combine them. But I do still believe that MEPFED allows you to finish projects more quickly, particularly when you are working with collaborators, because you can work on a component of a paper and then move on to another while they work on the stuff you sent them. I do find that WOPED is also useful when I don’t have to switch topics and they are somewhat related. For example, working on the human right to water and on bottled water and on privatization of public water supply is almost so interrelated that I could assign one day to “marketization of water” without any problems. Or for example, when I work on informal waste pickers and then switching to studying sanitation still feels as though I am dealing with related topics. But switching on the same day from polycentricity to the governance of informality in water feels a bit like too much of a jump. I’ll be testing both models throughout the year and will report back on my experience. Posted in academia, productivity, research. Tagged with MEPFED, WOPED, workflow. Thanks for the insightful post. How many projects do you usually work on at one time?